These little beauties are a real treat, hard not to eat the whole batch! They are made from desiccated coconut, cacao powder, medjool dates, cinnamon, vanilla powder, chia seeds, coconut oil and water. Of course you can sprinkle your own twist on them. They are gluten-free, dairy free, grain free and egg free. 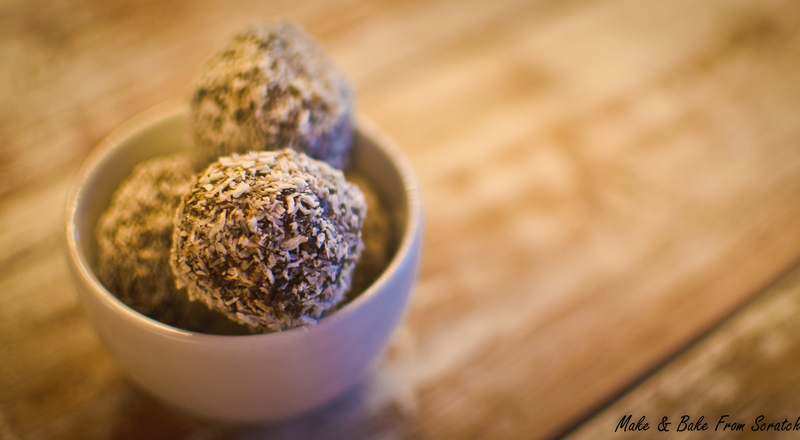 So if you have a sweet tooth get happy in the kitchen and make Coconut & Cacao Bliss Balls. Remove seeds from dates and roughly chop. In a food processor add nuts, dates, cacao powder, desiccated coconut, cinnamon, vanilla powder, chia seeds and coconut oil. Blitz until all ingredients are combined. It should have a paste like consistency. If it appears to look dry add a small drop of filtered water until the mixture sticks together. Break off bite size pieces and roll them into firm balls with your hands. Roll the balls in desiccated coconut, place them on a plate and pop to the fridge to chill.